It's time to not think about the markets or economics. So, to that end, here is a picture of the kids below. I will be back bright and early on Monday. The U.S. economy was hitting on virtually no cylinders in the fourth quarter, as gross domestic product fell at the fastest pace since 1982 on sharp declines in consumer spending, investment and exports, the government said Friday. GDP fell at a 6.2% seasonally adjusted annualized pace in the final three months of 2008, revised from the initial estimate of a 3.8% drop, the Commerce Department reported. It was the worst decline in GDP since a 6.4% decrease in the first quarter of 1982. "Economic developments in recent months have been consistently worse than the worst-case scenarios," noted Stephen Stanley, chief economist for RBS Greenwich Capital. Expenses associated with rising loan losses and declining asset values overwhelmed revenues in the fourth quarter of 2008, producing a net loss of $26.2 billion at insured commercial banks and savings institutions. This is the first time since the fourth quarter of 1990 that the industry has posted an aggregate net loss for a quarter. The ?0.77 percent quarterly return on assets (ROA) is the worst since the ?1.10 percent in the second quarter of 1987. A year ago, the industry reported $575 million in profits and an ROA of 0.02 percent. High expenses for loan-loss provisions, sizable losses in trading accounts, and large writedowns of goodwill and other assets all contributed to the industry's net loss. A few very large losses were reported during the quarter-four institutions accounted for half of the total industry loss-but earnings problems were widespread. Almost one out of every three institutions (32 percent) reported a net loss in the fourth quarter. Only 36 percent of institutions reported year-over-year increases in quarterly earnings, and only 34 percent reported higher quarterly ROAs. This is the first time since the fourth quarter of 1990 that the industry has posted an aggregate net loss for a quarter. It's been 17 years since we've seen the banking industry this sick. In addition, return on assets hasn't been this low in 20 years. What caused the the last set of problems? The savings and loan crisis. High expenses for loan-loss provisions, sizable losses in trading accounts, and large writedowns of goodwill and other assets all contributed to the industry's net loss. This represents a double whammy for banks. Not only are their assets decreasing in value, so are their loans. That means they're getting hit from both ends. Regarding the "A few very large losses were reported during the quarter-four institutions accounted for half of the total industry loss." Yes, there are some money center banks that are in deep trouble. These are the institutions referred to as "Zombie Banks". But note the remainder of that statement. "but problems were widespread." In other words, if we take care of two of three big banks, we'll still have big problems. Consider the following statement from the summary: "Almost one out of every three institutions (32 percent) reported a net loss in the fourth quarter. Only 36 percent of institutions reported year-over-year increases in quarterly earnings, and only 34 percent reported higher quarterly ROAs." Bottom line -- those are terrible numbers. Net income for all of 2008 was $16.1 billion, a decline of $83.9 billion (83.9 percent) from the $100 billion the industry earned in 2007. This is the lowest annual earnings total since 1990, when the industry earned $11.3 billion. The ROA for the year was 0.12 percent, the lowest since 1987, when the industry reported a net loss. Almost one in four institutions (23.4 percent) was unprofitable in 2008, and almost two out of every three institutions (62.5 percent) reported lower full-year earnings than in 2007. Net loan and lease charge-offs totaled $37.9 billion in the fourth quarter, an increase of $21.6 billion (132.2 percent) from the fourth quarter of 2007. The annualized quarterly net charge-off rate was 1.91 percent, equaling the highest level in the 25 years that institutions have reported quarterly net charge-offs (the only other time the charge-off rate reached this level was in the fourth quarter of 1989). The amount of loans and leases that were noncurrent rose sharply in the fourth quarter, increasing by $44.1 billion (23.7 percent). Noncurrent loans totaled $230.7 billion at year-end, up from $186.6 billion at the end of the third quarter. More than two-thirds of the increase during the quarter (69.3 percent) came from loans secured by real estate. Noncurrent closed-end 1-4 family residential mortgages increased by $18.5 billion (24.1 percent) during the quarter, while noncurrent C&I loans rose by $7.6 billion (43.0 percent). Noncurrent home equity loans increased by $3.0 billion (39.0 percent), and noncurrent loans secured by nonfarm nonresidential real estate increased by $2.9 billion (20.2 percent). In the 12 months ended December 31, total noncurrent loans at insured institutions increased by $118.8 billion (107.2 percent). At the end of the year, the percentage of loans and leases that were noncurrent stood at 2.93 percent, the highest level since the end of 1992. Real estate construction loans had the highest noncurrent rate of any major loan category at year-end, at 8.51 percent, up from 7.30 percent at the end of the third quarter. On the weekly chart, notice we're clearly forming a double top now. Also note the RSI is increasing and the MACD is about to have a bullish crossover. All the SMAs are moving higher, although the 20 week SMA is about the 10, and prices are above all the SMAs as well. On the daily chart, notice we're in a clear uptrend that started in mid-December. Also note that prices are above all the SMAs, the shorter SMAs are above the longer SMAs and all the SMAs are rising. 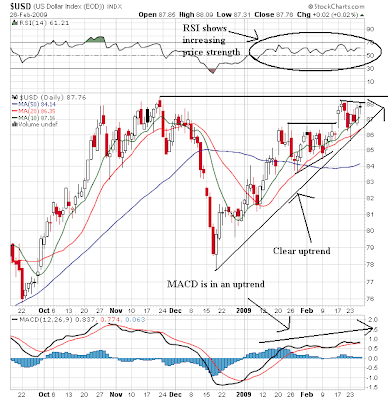 The MACD is rising and the RSI shows increased price strength. The main issue now is will prices move above the previous high? Notice on the 10 day chart that prices have moved through key support of the upward trending line that started a few days ago. On today's chart, notice that prices mved higher until about 10 AM and them moved lower for the rest of the day. Also notice that prices ended the day near their low point on a volume spike. On the daily chart, notice that prices moved through the 10 day SMA but could not maintain their upward momentum today. That's bearish going forward. The Commerce Department reported Thursday that sales fell 10.2 percent to a seasonally adjusted annual rate of 309,000, the worst showing on records going back to 1963. It was a weaker showing than the pace of 330,000 that economists expected, and shattered the previous all-time monthly low set in September 1981. Only the Northeast saw sales rise in January from the previous month. With nationwide sales sagging, an inventory barometer also ballooned to a record high. The government said it would take 13.3 months at the current sales pace to exhaust supply. That puts even more downward pressure on prices. Remember -- what's important from an "end of the cycle" perspective is for the rate of change in price to slow down. Considering the latest month over month rate of change and massive amount of inventory we're nowhere near that point right now. Home resales fell 5.3% to an annual rate of 4.49 million, the National Association of Realtors said Wednesday, noting that buyers were restrained by negotiations in Washington over President Barack Obama's economic-aid package. The plan, as signed last week by Mr. Obama, includes an $8,000 tax credit for first-time home buyers. "Given so much stimulus-package discussion in January, some would-be buyers simply sat out for clarity and certainty on the nature of the housing stimulus," NAR economist Lawrence Yun said. So -- this has squat to do with the housing credit in the bill. ...the median home price dropped 14.8% in January to $170,300 from the year-earlier level. The year-over-year drop in December was 15.2%. We're nowhere near a bottom in prices. When we start to see y/o/y drops of 3%-5% we'll know we're near the bottom. But until we see those kind of numbers in the y/o/y figures we're nowhere near done with the housing mess. A bloated supply of unsold homes is contributing to sharp price drops. Inventories of previously owned homes fell 2.7% at the end of January to 3.6 million available for sale. That represented a 9.6-month supply at the current sales pace. "Unfortunately, it's still so high, at just under 10 months, that it guarantees further price falls," said Ian Shepherdson, an analyst at High Frequency Economics. Economists say a normal supply level is about five months. I'm going to use the USO -- the ETF that tracks the oil market -- for today's writeup. The oil market has been dropping at a strong pace for 8 months now. Notice all the SMAs are moving lower with the shorter SMAs below the longer SMAs. Also notice there have been 6 bear market rallies where prices attempted to move higher but ran into upside resistance at an SMAs. Finally, notice the divergence of prices and the MACD over the last 4 mopnths. On the daily chart, prices gapped down big a week ago on Tuesday. Since then prices have been trading in a fairly narrow range. Then yesterday we say price sbreak out on strong gasoline demand. At some point markets stop moving lower. Oil is now incredibly cheap. However, price is usualy the worst measure of when to buy something. That is -- pure valuation is one of the worst timing mechanisms in trading. But that doesn't take away from the fact that oil is, well, cheap as hell at these levels. On the daily chart, notice that prices have remained in a roughly three point range for the last 4 days. Also note the bars are getting smaller over the last three days. However, all the EMAs are moving lower and the shorter EMAs are below the longer EMAs. The question on the 5 minute chart is has this chart reversed? Prices broke through the downward sloping trend line that started over a week ago. In addition, prices have moved through the 200 minute SMA. But coordinating this chart with the daily chart tells us we haven't fully reversed yet -- and won't until we move through the lower SMAs on the daily chart. Will The Consumer Ever Come Back? 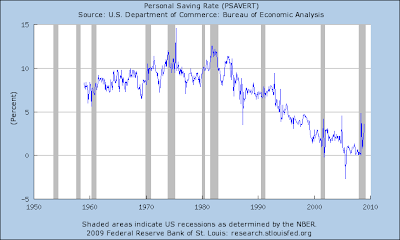 Above is a chart of the US savings rate. Notice its been declining for the last 20 years or so until it eventually started hovering around 0% and that it has recently spiked up. There are some people who are now arguing the consumer is retrenching completely; meaning, the consumer will no longer be the engine of growth. There are two strong fundamental reasons that support this conclusion. 1.) First, the best reading of job growth during the last expansion is for a total of approximately 8.2 million. In other words, job growth was extremely weak. In addition, we've seen fast rates of job loss over the last year along with real estate and stock market collapses. In other words, the macro environment is such that consumers may be paying a lot of attention to their bottom line and thinking, "I don't need to buy that right now." 2.) Total household debt outstanding has increased from 47% of GDP in 1981 to 96% of GDP in the third quarter of 2008. While there is no bright line in economics that says "above this level the household debt/GDP ratio is bad" I feel fairly certain in saying that when there is almost as much household debt as there is GDP in an economy there are serious problems. The point is the possibility that we are at a saturation level with household debt is pretty high. This leads to the conclusion that the consumer will start to pay his debt down leading to lower consumer spending. The Conference Board, an industry group, said its consumer confidence index fell to 25.0 in February, the lowest since the index began in 1967, from 34.7 in January. Consumers' gloomy outlook showed no sign of turning around, according to the report, boding ill for the consumer spending that drives some two-thirds of the U.S. economy. The data "suggests, unfortunately, that we still haven't found the bottom for the economy," said Zach Pandl, economist at Nomura Securities International in New York. There are a lot of reasons for this drop. 1.) The job market is terrible. In January 2007 there were 138,080,000 total non-farm jobs in the US compared with 134,580,000 in January 2008 for a total loss of 3.5 million jobs in a 12 month period. 1.77 million have occurred since the October numbers. In other words, job losses are accelerating. The day's U.S. housing data also offered little reason for optimism. Prices of U.S. single-family homes fell 18.5 percent in December from a year earlier, with the pace of decline speeding up, according to the S&P/Case Shiller home price index. That was the biggest drop since the data series began 21 years ago and suggested prices will probably continue falling in the months ahead, extending a 13-month-old recession. The S&P/Case Shiller composite index of home prices in 20 metropolitan areas fell 2.5 percent after dipping 2.3 percent in November. "There are very few, if any, pockets of turnaround that one can see in the data," said David Blitzer, chairman of S&P's index committee. "Most of the nation appears to remain on a downward path." A separate report from the Federal Housing Finance Agency said single-family home prices fell a record 4.5 percent in the last three months of 2008 compared with a year earlier, though the pace of decline slowed. Housing will not be anywhere near a bottom until we see the rate of year over year price declines slow. As a result, we can expect to see a continued drop in housing prices over the new 6 months (and probably longer). 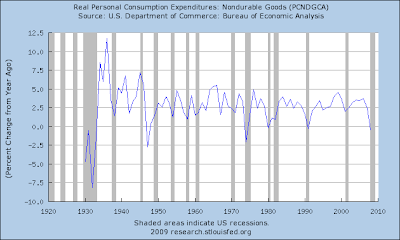 Overall personal consumption expenditures are dropping at fast rates on a year over year basis. 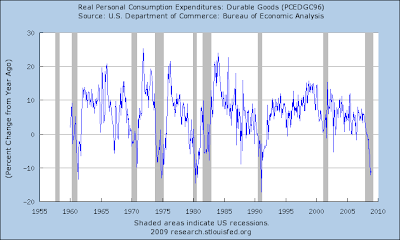 A big reason for this a a drop in durable goods purchases (cars and houses). But non-durable rates are dropping as well. To reverse this swoon in spending we need a stronger jobs market and a stable stock and real estate market. Neither is going to happen anytime soon. 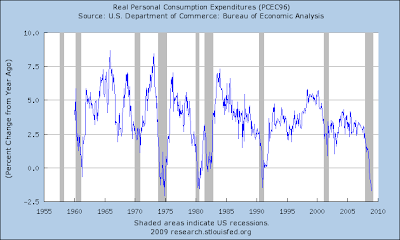 However, even when that happens, there are serious questions about whether or not consumer spending will return to pre-meltdown levels. I'll touch on that in the next post. On the yearly chart for gold, notice that gold broke through upside technical resistance in the early part of this year and has continued higher ever since. Prices have run up against highs established in July of last year on strong volume. The MACD states prices are moving higher. However, note the MACD is at its highest point of the last year. Also remember the chart above which shows prices are running into upside resistance at levels established last summer. -- The horizontal line at current price levels is the price level from last July. Let's look at a longer chart to put today's action in perspective. -- The current downtrend started with a big gap down last Tuesday. -- Prices levels out for a few days. -- Today, prices moved through previous resistance and are now on top of all the SMAs. Prices are are above the 200 day SMA. On the daily chart, notice that prices have some room to move higher before they hit resistance (namely, the 10 day SMA). If prices hit this and then continue to move higher, we'll be in a trend reversal. However, until that happens, we're still in a downtrend. In the very near term, Treasuries are faced with a lot of supply, which suggests a concession will have to be built into the market, but demand for safer securities is likely to remain high as we move toward the end of the month," said Robert Tipp, chief investment strategist at Prudential Investment Management's public fixed-income group. The Obama administration has launched a multipronged effort to arrest the economic downturn, but its success likely depends on how quickly the banking sector regains its footing. Despite its $787 billion stimulus package, any fiscal boost would be temporary if credit markets remain dysfunctional. The government is already largely standing behind much of the banking sector, insuring unprecedented levels of deposits and even guaranteeing new debt issued by many banks. A weakened banking industry makes it harder and costlier for businesses and consumers to get loans. But restoring confidence in the banking sector is proving one of the trickiest parts of the economic plan. Banks are still heavily exposed to the housing market, and rising foreclosures combined with falling house prices are putting enormous strain on banks and making it hard to determine how much money they have. Regulators are bracing for dozens of additional bank failures. Federal Deposit Insurance Corp. officials are pushing Congress to raise the amount of money the agency can borrow from Treasury to $100 billion, more than triple its current limit, with talks intensifying in recent days, say people familiar with the discussions. And housing isn't coming back anytime soon. A slide in small-capitalization health-care and energy stocks pushed the Russell 2000 index below 400 for the first time since the bear-market lows of November. For the session, the Russell 2000 index of small-capitalization stocks lost 16.38 points, or 4%, to 394.58. The Russell has fallen six days in a row. The last time the Russell closed below 400 was Nov. 20, when it ended at 385.31. Because the Russell 2000 is composed of smaller companies that rely on growth instead of an existing client base, the index is a great proxy for risk. And right now people are running from risk in a big way. Here is a long-term chart of the IWM -- the ETF that tracks the index. The chart uses monthly bars. Notice that prices are currently in the same price range as the 2003 - 2003 market bottom. In other words, we're essentially back to where we started. The only good thing on the chart is the decrease in volume over the last 4 months. This tells us that few people are dumping shares. Notice the SPYs have formed a double top with the first top occurring in 2000 and the second occurring in 2007. Also notice that price wise we're now moving below the 2003-2003 price levels. Like the IWMs, the one good thing with this chart is volume is dropping off over the last few months indicating fewer people are selling. Financial markets shuddered Monday with the Dow Jones Industrial Average falling 3.4% to 7114.78 -- or nearly half the peak it hit just 16 months ago -- even as the Obama administration tried to quell fears about the viability of major U.S. banks. The decline in the stock market was unusually broad and went well beyond the jittery financial sector, with technology and other economically sensitive categories driving major indexes to their lowest closing levels in more than 11 years. Notice the Dow is at it's lowest levels in over 10 years. But like the other charts, notice that volume is down over the last few months again indicating a declining number of sellers. -- The 20 day SMA is moving lower, while the 10 day SMA is about to move through the 20 day SMA. Bottom line: this chart looks to be consolidating. From a fundamental perspective, I'm guess there is a balance between the new debt coming on the market and concern about the stock market. In other words, new supply is getting trumped by "the sky is falling". Notice the strength of this downward swing today. First, prices spent the vast majority of the day underneath the SMAs. Also note the SMAs were all moving lower for most of the day. Also notice several bear market formations -- the pennants and triangles. Also note that prices continually ran into upside resistance from the SMAs. Finally, note that prices end at a low point on increasing volume. Bottom line: this is a damn ugly chart. On the daily chart, notice that prices are still moving lower. Also note that today's bar was really big. About the only good thing is today's volume was wearer than Friday's price action. I still love the simplicity of Dow theory. In a nutshell -- when the economy is doing well we need to ship more and more stuff. Therefore, we need more transportation services. This increases transportation company earnings which should increase the transportation sector. Simply reverse the process in a downturn. In other words, the Transportation average should confirm the broader market movements. The above video tells us we're nowhere near that point in the market. Given the limited scope U.S. authorities have for increasing the public debt burden without adverse asset market responses, it is best to forget about tax cuts or public spending increases. Instead, the available fiscal resources should be focused on restoring the flow of credit to nonfinancial enterprises and, to a lesser extent, to households (most of which are already over-indebted and should not be encouraged to spend more). Rather than wasting the $1.4 trillion of public funds it would take to restore (according to NYU economist Nouriel Roubini's estimate) the capitalization of the U.S. banking sector to its fall 2008 level, it would be better to use public money to capitalize new banks that don't suffer from an overhang of past bad investments and loans -- and to guarantee new borrowing or new loans and investment by these banks. This "good bank" model achieves this by identifying the systemically important banks that are kept afloat only by past, present and anticipated future public financial support ("bad banks") and taking their banking licenses away. The "stress test" proposed by Mr. Geithner for major banks (assets in excess of $100 billion) could be used to gather the necessary information to identify the bad banks. New banks, capitalized by the government (possibly with private co-financing) would take the deposits of the bad banks and purchase the good assets from the bad banks. Future government support, through guarantees or other means, would be focused exclusively on new lending and new borrowing by the new good banks and those old banks that passed the stress test. I have several issues with nationalization: who do you nationalize, how do you do it to minimize market disruption and how do you prevent political corruption from entering into the picture after you do it. The above plan comes much closer to addressing my concerns. First, I always liked the stress test idea. The Treasury has to go into all of the big banks and take a look at all their books in detail. And no party involved can pull any punches. In addition, the more a party tries to obfuscate the truth, the more trouble they are in. I've always thought this was the best way to figure out who gets help. In other words -- we know how to find out who. How is a big issue. The markets are already reeling from the threat of nationalization. Every time it gets brought up, the markets tank. This was cited as a primary reason for last week's market instability. In other words, the actual process of shifting from private to public ownership is an issue. Now enter the above plan. I would personally use the remaining TARP money to make one big bank. Then I would stress test all the money center banks at the same time and come out with a report on all of them at the same time. Force them to sell their good assets to the one good bank and let the dregs remain in the old banks. If you do this over a short time period -- say 2-4 weeks -- you can end this problem pretty quickly. The main reason I like the idea of one big bank is there is only one bank to monitor. That's been a huge issue for me with the idea of nationalizing the banks -- the idea that we would still have all of these banks to perform oversight on. With one big bank we just have one bank to monitor which is a much easier task. For me, it makes much more sense. Last week the market fell out of bed. Prices dropped below the lower trend line of a consolidation pattern that has been forming for about two months. Once prices fell below this line they went for broke with downside momentum. Assuming the chart is in the middle of a "measured move" -- meaning the distance it traveled before the consolidation pattern will equal the distance it will travel after the consolidation pattern -- we've got more downside running to do. Also note the price/SMA relationship is now extremely bearish: prices are below all the SMAs. all the SMAs are moving lower, and the shorter SMAs are below the longer SMAs. On the EMA chart, notice the EMA picture has been extremely bearish for some time. 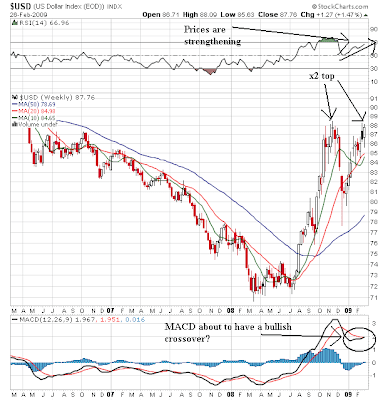 Notice that on the MACD may indicate the market has a lot further to drop. Bottom line: this is a bearish chart that does not bode well for the future.